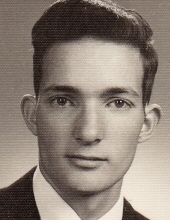 Donald Anthony Keys was born, July 4, 1940, the son of Bertram and Elizabeth (George) Keys. He departed this life, Monday, January 28, 2019, at the St. Joseph Medical Center, Kansas City. He is survived by his son and daughter-in-law John and Sarah Peppers-Keys of St. Joseph, Missouri; his daughter, Colleen Speers of Raymore, Missouri; his sister, Joanne LaBow of Lincoln, Nebraska; 10 grandchildren; 4 great grandchildren; other relatives and friends. Visitation will be held 6:00 p.m. until service time at the funeral home. To plant a tree in memory of Donald A. Keys, please visit our Tribute Store. "Email Address" would like to share the life celebration of Donald A. Keys. Click on the "link" to go to share a favorite memory or leave a condolence message for the family.